In response to customer requests, we created a combination gift pack of our popular mountain souvenir soaps along with the 'classic' scents The SoapShed started out with years ago that our regular customers love so much. The Mountain and Classic Scents Sampler includes ten bars, one each of our Mountain Morning Wake Up Call, Carolina Kudzu, Blue Ridge Wildflowers, Southern Belle, Fresh Mountain Air, Appalachian Sunrise, Grandma's Garden, Arzella's Vanilla, Sweet Lemongrass, and Calendar Girl (gardenia). 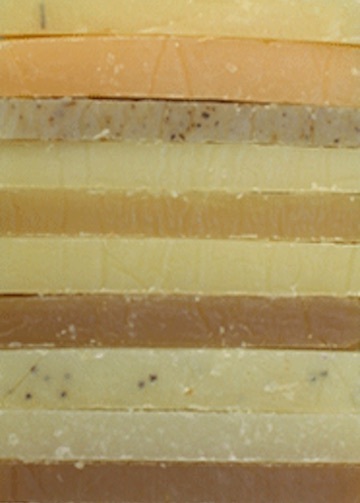 Minimum weight 15 ounces, or four bars of our regular size soap. Olive, Coconut, Palm and Castor Oils, Shea Butter, Cocoa Butter, Sodium Hydroxide (Lye), Mountain Spring Water, ground medicinal herbs, cornmeal grits, pumice, coffee grounds, Basil Essential Oil, fragrances.